A. Registration open January 14th. Take advantage of our online discounted Early Registration that runs through March 24th. Q. How do we register? Q. What equipment is needed? A. For tackle football players, Camarillo Cougars provides the helmet, shoulder pads, game jersey, practice jersey, knee pads, socks, belt and padded pants. Please note that helmet, shoulder pads, practice jersey, belt and padded pants must be returned at the end of the season. Parents must provide cleats (METAL CLEATS ARE NOT ALLOWED), mouthguards and protective cups. Q. Where and when is equipment distributed? A. Equipment will be distributed in early July. Helmet and other equipment distribution will take place also in July. Specific date is TBD. All registrants will be given their time in advance and must attend their pickup time. Please check out our calendar for more information. Q. What if we don't think the equipment fits correctly? A. Experienced Camarillo Cougars Football coaches will fit your child correctly during equipment handout. The equipment is fitted to each child at the time it was issued. Helmets are supposed to be tight to prevent injuries. If you feel your child wasn't properly fitted, please discuss it with your head coach and he will get it resolved. Q. Does my child need a physical to play football or to cheer? A. Yes both football players and cheerleaders will need physicals. We recommend that you schedule your medical exam during the summer, before practice begins, so you do not miss any practice time. Physical forms are due the first day of practice. The forms will be emailed to you upon your completion of registration with a link to all the forms to be filled on Docusign. No child can participate without a signed physical form on file with us. Q. Does my child need to show a birth certificate or passport to play? Q. When and where are practices? Practices will begin Monday, July 15th. Practice is mandatory from July 15th through July 26th from 5:30pm - 7:30pm. Each head coach will determine their own practice schedules after the mandatory practice is held. Practices are held at Freedom Park located at 480 Skyway Dr, Camarillo, CA 93010. Later in the season teams will practice at Mission Oaks Park located at 5501 Mission Oaks Blvd, Camarillo, CA 93012. Q. How much time is involved in the football program? A. The season begins in late June and initially we start with a mandatory 5 day a week practice for two weeks then we scale down. Your child’s coach will determine the practice time after the mandatory 2-week practice is completed. As the season gets closer we will update you on exact days and times. Q. When will we know what team we are on? A. Registration for the 2019 season closes in June. Teams will start to form and finalize after this date. If there are multiple teams in a division the teams are not selected until after practice date TBD. The coach or team parent will contact you with further details. Q. Are teams based on age or weight? A. Both. The GCYFL after 4 years having X-players in all divisions, continues to offer all players the opportunity to play with players in their age group. We offer a safe place to play no matter how much or little you child weighs. Our lighter players can play in a division with younger players. Our average weight players play against similar weight & ages and our heaviest player are not forced to play up multiple divisions as is found in other Football Leagues. We want everyone to have a place to play without compromising safety. Click here to see the GCYFL age and weight chart. Q. Where are games held? A. Our home games are held at Rio Mesa High School. There are 19 teams in our chapter. Click here to view the list and locations of these teams. Q. How much time is involved in the cheer program? A. The season begins in late June and initially we start will 5 day practice for two weeks then we scale down. There are practices 2 evenings per week, every week for about 1.5 hours each. Games begin in August. As we approach competition there will be additional practices. As the season gets closer we will update you on exact days and times. Q. Is it a problem if my child misses some Cheer practices and/or games? A. Cheerleading is a difficult sport and a team effort. Cheerleaders will learn routines, lifts and stunts. When a Cheerleader does not show up for practices this could affect the entire workout. Cheerleaders that miss practice may not know how to perform the routines or stunts that are being taught which endangers the themselves and the teammates. All Cheerleaders need to make every effort to be available for each practice session throughout the season. Q. Can the Cheerleaders paint their faces with logos and wear sparkle body lotions and makeup? A. Cheerleaders are allowed to wear suitable makeup if the parents allow it, but for safety reasons glitter is not allowed. Q. My cheerleader wants to be on the same team with all her friends. Is that possible? A. You may make a request at the time of registration, and your request will be noted. WE DO NOT GUARANTEE ANY REQUESTS. We will make every effort to put friends together if they are able to be in the same division, but ages of divisions overlap slightly and in order to have the numbers necessary for each team, we may not be able to accommodate everyone. Q. 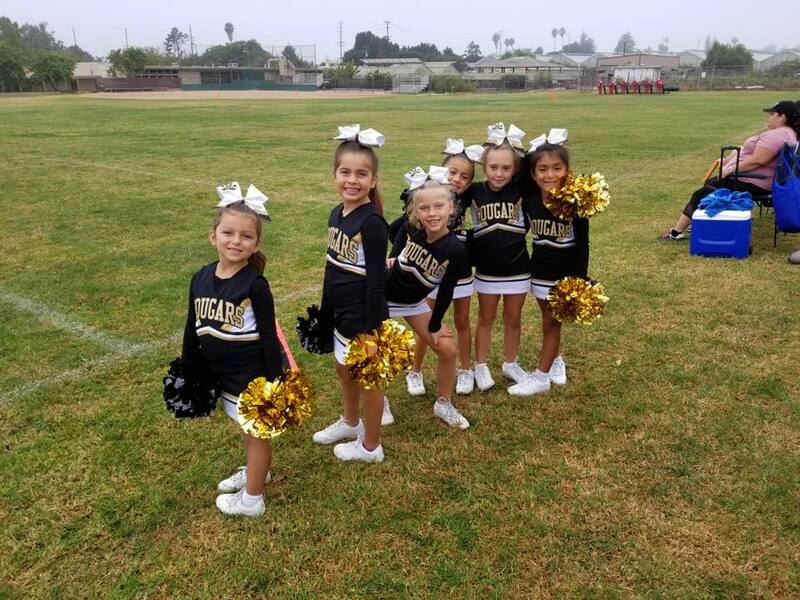 Can my daughter cheer for my son's team ? A. You may make this request at the time of registration. We make every effort to pair sibling if they qualify to be in the same division. Note that cheerleaders are placed solely by age and skill level. Q. Where can I find out about league rules? Q. What is the GCYFL? A. The GCYFL is an acronym for Gold Coast Youth Football League. Being part of this league ensures that we play by the same rules against other of communities of like size.